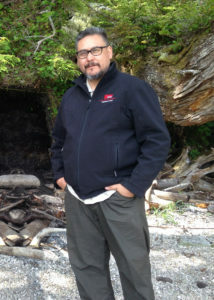 Rudy is an Indigenous Archaeologist from Skwxwu7mesh Uxwumixw (Squamish Nation) at Simon Fraser University with a PhD from McMaster University. 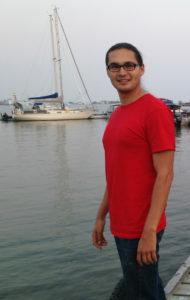 His dissertation examined the spatial and temporal distribution of Iithic materials from six distinct Iithic sources, Iithic materials from 25 archaeological sties, using X-Ray Fluorescence, from sea level to alpine contexts to determine the differential use of specific types of Iithic materials spanning 10,000 years. Dr. Rudy has a particular interest in obsidian volcanic glass, a versatile weapon and tool-making material that is stronger than surgical steel and was highly valued and widely traded by indigenous peoples. Rudy Ikce wicasta kin he makoce owaunspe wayupike. 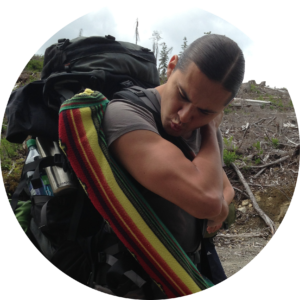 He (Squamish Oyate) Skwxwu7mesh Uxwumixw etanhan. Simon Frazer wayawatipi etanhan iyukcan wicasta(phD) ic’ikage. Omaka ota etanhan kahnigepi. Maka ohna taku ota unspeic’iciye hehan taku ota wicohan unspeic’iciya wayake. He stodyekte, tohanya taku makoce ohna yanka kin. Maka etanhan sakpe toktokce. Heced ed wayake. Taku owas owa ehneke. Makoce ataya omaka tohantuca kiktopanuge hehanya huhu q’a inyan hena maka ohna ed iyapi. Dena owas wikcemna numpa som zaptan heced Unci makoce ataya ed wayakapi. Kiktopanuge wikcemna hehanya ed wicohan ed wayakapi. Dr. Rudy wicasta kin he, inyan kin wan, iyeya kinhan he nina tehinda. Ojibway and French from Serpent River First Nations in Northern Ontario, Jenifer Brousseau has been performing since the age of 5. Trained at Lyric School of Acting in Vancouver BC, she has traveled throughout the world with various foundations and humanitarian organizations; hoping to bring inspiration and change using theatre and creative arts as a tool to especially inspire Canadian youth. 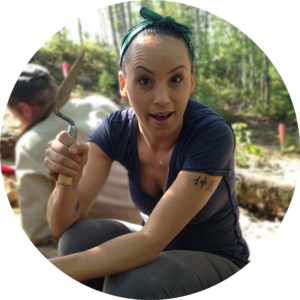 This formidable woman has played many thought provoking roles, both on screen and stage, and is currently a host of APTN’s forthcoming documentary series, Wild Archaeology. With her powerful voice, Jenifer likewise entertains throughout the world as a session vocalist, with the Aboriginal Women’s singing ensemble, M’girl; having previously touring Germany and New Zealand. Utilizing her passion for imagination and creativity through the language of writing, theatre and music, you will find Jenifer spending her time as Creator, Writer, as well as, Artistic Director of the suicide awareness and prevention play, Beneath the Surface. A poignant production, which has toured throughout BC and Alberta and continues to impact, and even save, many lives with its pertinent message of hope. Hahatonwin qa iyatokca Serpent Wakpa Oyate Ontario, waziyata etanhan hed wikoske kin he owanyankapi cistinang etanhan. Lyric Wayawa Tipi hed wounspe icu, Vancouver, BC hed. Makoce ataya omniciya wicohan ikikcu. Ikce wicasta pi kin, nina ota kici waecun. Toked oyate kin wakantu owicakiyakte tukted ohna hecun. Teca pi kin hena, unci makoce ataya kici waecun. Owanyankapi wasteste hena kici waecun. Wikoske kin de wicoh’an tokcakca ota ikikcun, koka wayakapi qa oniya hehan dehetuyeda APTN makoce owaunspe ikceka akan yuha waecun. Ho nisko tanka naka, makoce ataya dowan wikoske wicayahdate winyan tokca kici owasina dowanpi, M’girl iciyapi. Nakun Iyasica qa Ikce Wicasta New Zealand heciya omani dowan unpi. Wikoske kin he owanyankapi qa wowapi caga qa odowan wasteste tawacin un wicohan ic’ic’u. Jenifer ia waupike qa wowapi caga kin hena nina ksape. Beneath the Surface he, wicoiye kin hena tuwe ic’ikte skan pi kin hena owicakiye. Unci makoce ataya ite icupi koka hena ataya omani, BC, AB owasina otonwe kin ataya iyohpiya skan. Jacob koska kin he nina ksape. Wicoh’an ota ic’ikage. Oyate tecapi kin hena wausida hece kici waecun. Hed ohna iyokipi. First Nations University of Canada, Business Administration hdustan qa wowapi k’upi. Koska kin de, Jacob, iyuskinyan waecun; wowapi wanji, Native Lifestyle Magazine wicoiye wasteste kage. Wicata wi, 2016 Aboriginal Youth Entrepreneur of the Year kahniga pi. Makoce ataya omani ikce wicastakici iyokipiya skan. Ahana waci qa, can ohominiya qa jojoda nakun hoton kiye. Wacipi nakun kage. Inspire Awards 2013 – 2015, Jacob wohdake wayupike. Tuwe cinke kin han, website jacob-pratt.com ed wadaka pi kte.